Or, Why Armadillos, part 3? After I made The Truth About Armadillos and entered it in the Tompkins County Quilters Guild show, I apparently had a reputation in the community as an armadillo lover. I came home from work one day to find a brass armadillo sitting on my door step. He was about eight inches long and five inches high and had a nice brassy weight to him. There was no note, no indication of where he had come from. I took him in, figuring he needed a good home, and set him high on a window sill on the front side of the house so that whoever had left him there could see he had been taken in out of the cold. I mentioned him casually to my friends, but no one admitted to knowing anything about him. A few days later I came home and had a shock. The brass armadillo was outside, pausing during a climb up a pile of gravel that was waiting to be spread over my driveway. Not believing that he would leave the house on his own, I was certain someone had broken in and brought him outside. Then I looked up and saw the first brass armadillo sitting where I had left him on the window sill. The mountain climbing armadillo was the first orphan’s twin. 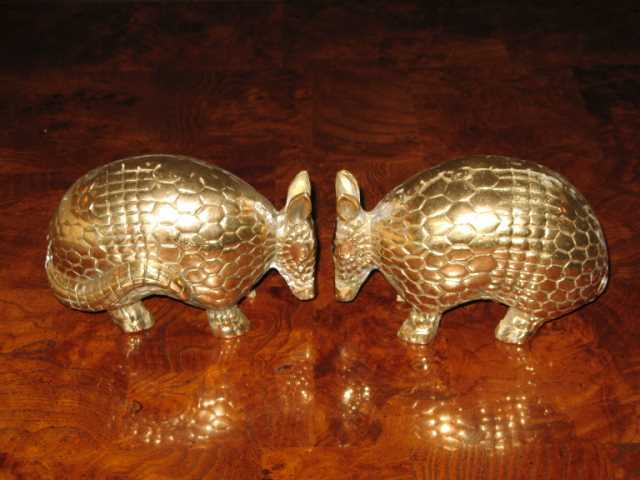 Now I had two brass armadillos and still no idea where they had come from. As time went on, I wracked my brain, trying to guess who had left me armadillos anonymously. I confronted everyone I could think of, but no one ever confessed. To this day, I do not know who the culprit was. I only know the armadillos found their way to my house, and they live with me still. Fortunately, I like a little mystery in my life. Very nice. . . . Story, armadillos, mystery, all.